Jake was beyond excited when he opened one of his 6th birthday gifts from his parents and saw the 1000 piece train engine puzzle he had asked for. I was excited, too! 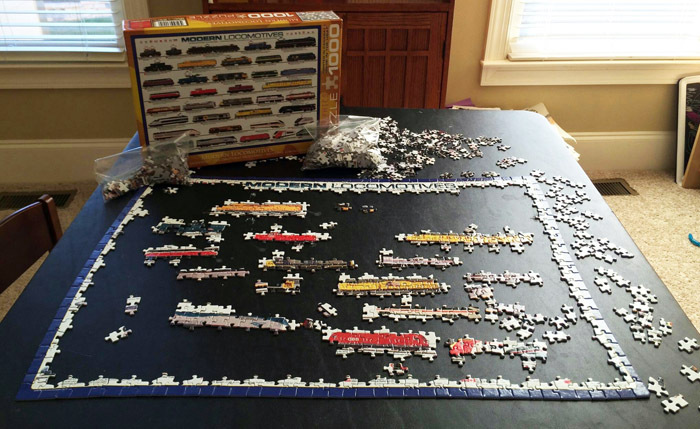 I really enjoy puzzles, but this one looked difficult and did I mention it had 1000 pieces! This photo shows about how far along Jake and I got while I was visiting. He may have it finished the next time I visit, or not. I’m not that big into train locomotives but Jake is, and that’s enough for me to enjoy this puzzle. As I was thinking about this particular puzzle, it dawned on me that this looks a lot like my mind must have when I first started learning about God. People who loved me, who knew way more than I did about God, helped me put together a border. They told me that God was my Father in heaven, and that he sent his one and only Son to die on the cross so that my sins would be forgiven. I memorized John 3:16 and Psalm 100. However, like the trains in Jake’s puzzle, the stories did not connect; they were sweet, colorful, and exciting, and I learned as much about the stories as I could, but each was its own entity. It didn’t take long for Jake to get a little frustrated because he couldn’t complete any engines. I had sorted and bagged the pieces according to color, and because the engines all had more than one color on them, and all of the wheels were black, they were all missing pieces. Honestly, I didn’t think Jake was ready for that bag to be opened – there were a lot of wheels in that bag! Jake decided he was ready to take a break. It looks like it has been a long break. I think most people think about the Bible as a whole the way I thought about those wheels –Leviticus, Isaiah, Ecclesiastes, it’s too big and they all look just alike – save it for later. And, like Jake, there came a time when I wasn’t really interested in adding more stories. Yet, without the wheels, the trains can’t sit on the tracks and they can’t connect to the border. Moreover, without reading all of the, dare I say, “Less fun books of the Bible”, we can’t know how all the stories connect. The Bible is so much more than a collection of stories and yet it is one magnificent story: the story of the redemption of mankind by the saving grace of God received through faith in Jesus Christ of Nazareth. The story of Adam and Eve in the garden tells us we need a Savior. King David tells us that there will be a Savior who is a King. Mary and Joseph tell us that our Savior is none other than God himself. The cross tells us that our salvation has been accomplished through our Savior. John’s Revelation tells us the Savior will return. For a long time, I was content to let my Bible stories float around disconnected. But there came a time when I knew I needed wheels. I needed to know how the Bible fit together and I needed to know how God fit into the stories. Why? Because I knew enough to know that I was falling into error, but I didn’t know enough to know why. I don’t know how, but I do know that God graciously gave me enough insight to know that the answers I was seeking were in the Bible. The most amazing thing happened when I started studying and reading the Bible –the “not so fun” books started to make sense and became quite an adventure to study through. It also didn’t take long until I enjoyed reading through the Bible as a whole, and even look forward to it each year. No one is too young to hear the whole story of the Bible. No one is too old to begin reading through it. What does your puzzle look like? Are the Bible stories simply wonderful little vignettes that float around in your mind? Isn’t it time to give them wheels? Isn’t it time to read and study God’s Word to discover how it all fits together. It is not a difficult puzzle. It is a great picture – and you are in it.